The language school EC English was founded in Boston, USA in 2007. 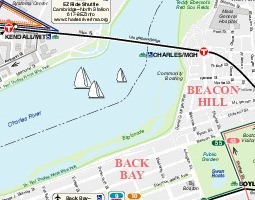 Located in a beautiful building in the heart of the Back Bay district of Boston. The school is a couple of blocks away from Coply Square, just minutes from Copley T Station, the Boston Public Library, Prudential Center and historic Boston Common. Best arrival airport is General Edward Lawrence Logan International (BOS). In 2019 (including national and regional bank holidays): 01.Jan.2019, 21.Jan.2019, 18.Feb.2019, 15.Apr.2019, 27.May.2019, 04.Jul.2019, 02.Sep.2019, 14.Oct.2019, 11.Nov.2019, 28.Nov.2019 - 29.Nov.2019 - 25.Dec.2019, 25.Dec.2019. Choice of 2 electives from 12:45 to 14:15. Offer on accommodation: For enrolments of a minimum of 1 weeks, accommodation required - Get a 15% off at North End Apartment for stays until 15 June 2019. . Only valid for bookings at this website before 31.05.2019. Only valid for courses starting after 01.01.2019. Offer on Accommodation : For enrolments of a minimum of 1 weeks, accommodation required - Get a 15% off at Standard East Boston Apartment for stays until 15 June 2019. . Only valid for bookings at this website before 31.05.2019. Offer on Accommodation: For enrolments of a minimum of 1 weeks - Get a 15% off per week at Homestay (single room or double room) for stays until 15 June 2019. . Only valid for bookings at this website before 31.05.2019. Only valid for courses starting after 19.01.2019. Choice of 5 electives from 12:45 to 14:15. 20 General English + 10 English in the City per week. Course times above include 5 electives from 12:45 to 14:15 per week. Depending on the available timetable, students enrolled in this course will be taken outside the classroom 1 or 2 times per week. 20 General English + 10 English for Work per week. Choice of 5 electives. Exam fees are not included. Note: All courses offered by EC English, Boston can be reserved online with LanguageCourse.Net. In case a course is not listed above, just mention the course description in the comment field of the online registration form. Individual classesSingle individual lessons of tuition can be reserved at 80 US$. The combination of group and individual lessons is highly recommended. Individual lessons will encourage you to actively speak the foreign language and will offer you the opportunity to discuss individual problems and weaknesses. Comments about courses:Double Banking: Lessons alternate between morning and afternoon sessions on a daily basis. High Season Supplement not applicable to bookings longer than 12 weeks. Individual lessons only available as a package with another course. Minimum 2 lessons. - Student insurance (optional) up to 65 years of age: USD 25 (per week). - 66-69 years an insurance supplement of USD 21 (per week). Bank Transfer Fees: USD 31. Towels, Bedding/linen, Weekly cleaning, Access to laundry service, Kitchen, Heating, Breakfast & 1 meal, Shared bathroom. Towels, Bedding/linen, Weekly cleaning, Access to laundry service, Kitchen, Access to Wifi in building (Free WIFI), Heating, Breakfast & 1 meal, Shared bathroom. TV, Bedding/linen, Access to laundry service, Kitchen, Access to Wifi in building (Free WIFI), Air conditioning, No meals, Shared bathroom. TV, Bedding/linen, Access to laundry service, Kitchen, Air conditioning, No meals, Shared bathroom. TV, Phone, Bedding/linen, Weekly cleaning, Access to laundry service, Kitchen, Access to Wifi in building (Free WIFI), No meals, Shared bathroom. TV, Phone, Bedding/linen, Weekly cleaning, Access to laundry service, Kitchen, Access to Wifi in building (Free WIFI), No meals, Private bathroom. Students aged under 18 must book homestay and provide a parental consent form. Unaccompanied minors: USD 50 fee applies. Shared Accommodation: students arriving from 20.00 to 11.00 must book an airport transfer on arrival, or may check in the following day after 09.00. For North End Apartments: No mix gender in the apartment. Students must keep noise to a minimum. Insider tips about what future students should not miss: Try to speak only in English, it helps a lot. Insider tips about what future students should not miss: I liked being in Boston on July 4th. Do you know someone in particular with whom you would love to explore life in Boston? Just tag them in your post to Facebook or send them a link to this page in a message or email.